Dr. Marty Fox, as many of you know is one of the well known regular great callers of the William J Bennett show, "Morning in America". Bill Bennett and the listeners to Bill's show, call him lovingly Dr. Marty. He is not just very informative when he calls into Bill's show, but he is ultra witty with his great quips. In one of my previous posts I have called Greg Gutfeld the King of quips. Dr. Marty Fox is the king of quips for those who call in to radio talk shows. On Tuesday morning, Dr. Marty was not a caller into the Bill Bennett show but he was a scheduled guest to talk about Bill O'Reilly's interview with President Obama on Superbowl Sunday. NOTE: I have the complete audio of the Dr. Marty segment at the end of this post via podcast. Dr. Marty Fox summed up the interview with: "O'Reilly did a very good job at asking the tough questions to the president, and president Obama did a very good job of avoiding answering those questions." Dr. Marty regretted that O'Reilly didn't do a better job of following up with Obama's non responsiveness to his questions. To quote Dr. Marty, "It was like the two had a deal before the interview. Obama would let O'Reilly ask the tough questions, and O'Reilly would let Obama get away with not answering them." Dr. Marty, giving respect to Bill O'Reilly says it is true that Bill only had 10 minutes in the interview and he wanted to ask a lot of questions. He also mentioned that O'Reilly admitted he would ask the questions and let the people decide for themselves the truthfulness of Obama's answers. But Dr. Marty is right when he says there are so many low information voters out there O'Reilly needed to point out the obvious non answers by Obama. Bill Bennett asked Dr. Fox what he would have done if he did the interview, and the doc said he would have followed up even if it meant there were less questions asked. Dr. Marty said when Bill O'Reilly asked the president if he was told by Leon Panetta that Benghazi was a terrorist attack, it was not only obvious to everyone that Obama avoided answering that question but O'Reilly let him get away with saying that he said it was a terrorist attack the next day. Dr. Marty rightfully said O'Reilly needed to point out to the people how deceptive Obama was in saying that by pointing out all the times, for the next few weeks the president went out of his way to avoid saying that it was a terrorist attack [like on The View and the Letterman show and at the United Nations, etc.] and in fact the administration put out the narrative that it was a spontaneous demonstration that got out of hand due to an "ugly" [sic] U-Tube video against Mohammad. I wish, like Dr. Marty, that Bill O'Reilly would have pointed that out. Next they talked about when Bill O'Reilly elicited from Obama his remark that there was not a "smidgen" of corruption by the IRS. That statement was actually true by president Obama that there was not a smidgen of corruption. 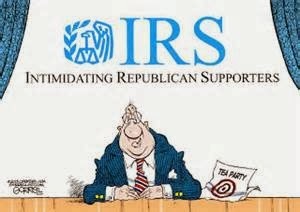 As Dr. Marty pointed out there was a whole bunch of smidgens of corruption [beside the obvious targeting of tea party groups and other conservatives]: Lois Lerner taking the fifth; Dr. John Eastman and others having personal information illegally disclosed by the IRS to other agencies; Jay Sekulow pointing out that not one tea party has yet been interviewed by the supposed investigators-an investigation led by a big Obama donor. So, kudos Bill O'Reilly for asking the great question to elicit Obama's "smidgen" response that will always be on record that hopefully will be destroyed before this president gets out of office. But Bill O'Reilly needed to set the record straight because by not doing so most Americans who were watching the interview will take Obama's smidgen remark as proof that there was no scandal there and it is time to move on. Then Dr. Marty turned to when Bill O'Reilly questioned the president about Obamacare. Bill O'Reilly kept the focus on someone being punished for the disastrous roll out of Obamacare. While that was a good question there were so many more important issues regarding Obamacare that O'Reilly could have honed in on. President Obama told Bill O'Reilly that there were problems at the beginning but Obamacare is working great now and Obama just threw out untrue and completely misleading statistics to bolster his claim. Obama said 3 million Americans had signed up for Obamacare through the exchanges. What he didn't say, and what O'Reilly never called him on, is that most of those people already health insurance but were thrown off it because of Obamacare; so they had to sign up with the exchanges. Then Obama told a big whopper how 6 million have signed up for Medicaid because of Obamacare. But almost all of those 6 million either had Medicaid or were eligible for Medicade, even if Obamacare had never come into existence. Plus it was never mentioned that millions of Americans would either lose their jobs, or have their work hours lessened because of Obamacare. I didn't expect that Obama would bring that up but I was hoping Bill O'Reilly would have. Also, a point I didn't think about, that Dr. Marty brought out with Dr. Bennett is that while Obamacare through its subsidies gave incentives for people to not work, it also gave incentives for people to not get married. There is a de facto penalty in Obamacare for married couples because many if not most married couples wouldn't qualify for the subsidies that they would qualify for if they were single. Hmm, so while Democrats incredibly are applauding the fact that Obamacare incentivises people not to work so they can then get health insurance and have more free time to pursue their dreams, will they now say that Obamacare incetivises people to get divorced so they can get their Obamacare subsidies. Oops, I let the cat out of the bag to the leftist Dems. We may be hearing soon: "Good news Americans. Obamacare allows you to get divorced and follow your dreams because you will be getting your Obamacare insurance subsidies." No work. No marriage. But you get your insurance coverage paid for by every other hard working American citizen. What a country? Or should I say Oy Vey, will this be our country? Dr. Marty at the end of his dissection of the O'Reilly interview, turned to the post interview. O'Reilly showed the post interview on The Factor the night after the Super Bowl. This was the part of the interview that we didn't see on Super Bowl Sunday. Bill O'Reilly asked a great and important question to president Obama, but then failed to point out a very important omission in the president's answer. Bill O'Reilly asked the president why he wasn't speaking out and trying to do something about the constant and ever increasing inner city problems of poverty and violence and unemployment and unwed mothers. President Obama told Bill O'Reilly that he and Michelle do talk about that all the time, that men should take responsibility for their babies, and how they should be responsible for themselves and not get involved with gangs or violence, etc. These are all very good things by the president to mention, if he indeed has been talking about it all the time, which is dubious considering so many other lies he has told. But Dr. Fox caught something missing in the president's answer [something that had nagged me but I couldn't put my finger on what it was]. Dr. Marty caught that president Obama never mentioned the word marriage and how important it was to get married before having children [or at least getting married to the mother after having a baby]. Bill Bennett liked this point very much because Dr. Bennett has said many times [and also Bill O'Reilly has mentioned this many times] that getting married before having children is one of, if not the most important ways of staying out of poverty. How could Bill O'Reilly have missed that most important omission in Obama's answer? Dr. Marty Fox quipped that he has never heard the first lady ever talk about problems that inner city folks are facing because all he ever hears Michelle talk about is what food kids should eat. 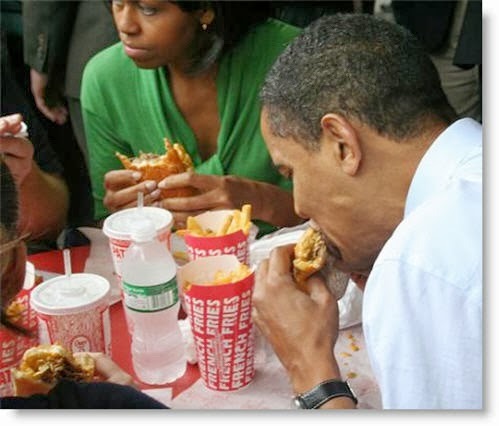 The first lady is very food conscious, as you can tell from the picture. Also, Dr. Marty pointed out that you never hear president Obama encouraging marriage. In fact, if you remember Julia, the internet generated unwed mother that the Obama campaign created, who happily relied on big daddy government from cradle to grave, Obama seems to favor single Moms over married women with children. I truly believe President Obama's dream is that this country will became a country with a majority of Julia's, whose majority votes would then advance the socialist agenda. Bravo, Dr. Marty Fox on a great critical dissection on a point by point basis of the O'Reilly interview with president Obama. Dr. Marty, the man who's really looking out for the folks! I would have loved to hear Dr. Marty Fox on longer, but as he told Bill Bennett, he had to go to work in order to support the Obama voters, so that they can stay home and get their Obamacare subsidies.